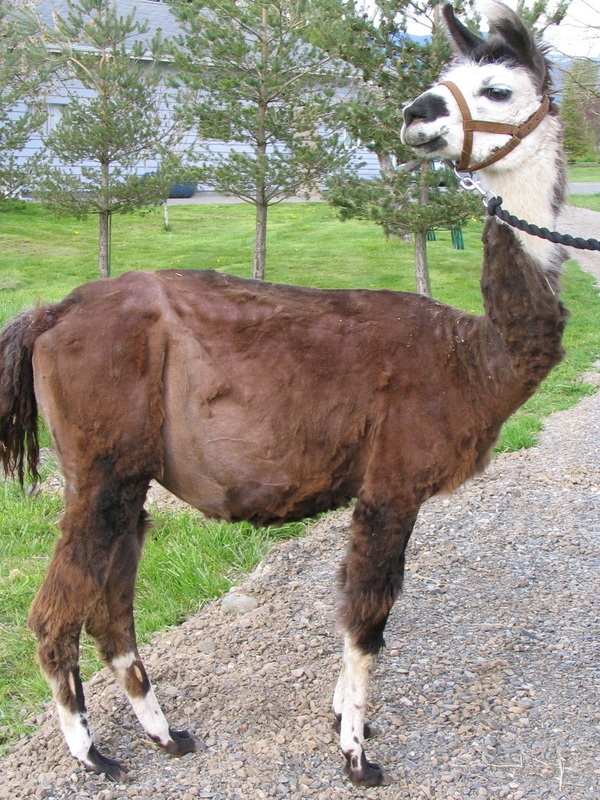 This poor female was seized by animal control along with 40 other llamas. The owner was allowing the llamas to just interbreed etc. This female was less than a month from giving birth. She was severely underweight and had no care program. Buying from backyard breeders creates & encourages situations like this one! We all love a "Good deal." As consumers we are taught to always shop out the very best deals, using coupons, specials etc. Sometimes you can shop out the very same thing and get it for a fraction of the asking price, however this is not the case with quality animals usually. We all want to stretch our dollars and in this challenging economy that can be hard. When it comes to buying companion animals, you have to be careful to get animals that are not only healthy, but have a good history of longevity. Camelids need to be able to survive soundly for 18+ years. In addition, they have to be suited and appropriate for the job/need you have. Well trained and properly socialized animals help to ensure lifelong ownership too. As a breeder that does rescue, I find that not everyone realizes the value or time that goes into properly breeding and raising a camelid. Many uneducated buyers think any old llama will do for guarding, packing, 4-H, driving etc. This is not so, and many of those animals end up in rescue when the new owners aren't able to do what they want to do with them. For some people a rescue is a great match, but expecting most to be able to perform these jobs is like buying your marathon running shoes at Walmart. There are reputable and not so reputable camelid breeders out there. A reputable breeder guarantees their animals and makes sure they are healthy, trained on basics (feet, halter/lead broke, loading in a vehicle, grooming etc.) and properly socialized. New owners should be able to go out and fairly easily catch and halter their animals in a small catch area. The animals should be reasonable about having feet picked up for trimming toes monthly and stand quietly for grooming. If this cannot be accomplished, you should not even consider purchasing this animal. Good breeders guarantee their animals by a contract. This contract allows the new owner to return or exchange the animal for another (during a specified time period) if they do not match up well with them. It also stipulates how situations involving pre-existing conditions will be handled. Reputable camelid breeders (like many of the reputable dog breeders) outline expectations and limit breeding options to help prevent more pet quality animals being dumped on the market. New owners do NOT need to be breeding or buying pregnant animals. It is important to learn and work with what you have, not make more animals that you hardly know anything about. Reputable breeders also register their babies, including the pet quality offspring. Some also do DNA verification on their babies and microchip them. When you go to look at a farm you are considering buying animals from, you should observe the situation they are in. Are the pens clean and free of manure piles? Are the water buckets/tanks clean? Do all the animals look healthy and in proper weight? Do the animals look cared for? Does their area look appropriate for the number of animals contained within it? Do they have a consistent feed/health program that they can show you when asked? Do they have adequate shelter, fencing and food? Does this farm look reputable? Farms do not have to be fancy, but they should look clean and the animals should be well kept. Manure should never be left out in the field or in the paddocks. Animals should be groomed appropriately, their nails should be trimmed and they should appear to be in good body condition. When you look at the animals, they should also be free of wounds, patches of missing hair (mange or lice) and other obvious health issues. Most reputable farms that work with their animals, have only a handful of babies a year. These babies are carefully planned and are bred for a specific purpose. Babies should be trained on basics of care and they should exhibit proper behavior and calm attitudes. Babies need to be on routine care plans of minerals and supplements. Babies should not be sold without another llama or leave the farm at less than six months at the very earliest. Beware of babies that are being billed as “Trained” because they were used by 4-H youth. This is not always a good thing and depending on the youth, some animals get spoiled and ruined. There are good youth handlers out there, but we have personally had to rehabilitate and re-home numerous 4-H animals who were ruined when used as babies by kids. 4-H kids should not be exploited to sell an animal. Reputable breeders breed for a specific purpose. Claims of "Would make a good (fill in the blank)" from producers who do not even do these things are as silly as claiming your Toyota Prius would be good for doing the Indy 500. Llamas have to be suited for the job they are sold/bred for or your chances of success in those areas are far less. Additionally, if you have questions on training for these things, the farm you purchase from can guide you through that because they actually have experience in this area. Breeders who care about what they produce make themselves available to answer new owner questions about their animals. Some will even keep the animal at their farm and have you come and learn how to care and work with them. They will act in the capacity of a mentor and help guide you through the process of ownership of the animal they have sold you. They will also be willing to take their animals back/help re-home should your situation change in the future. They care about their animals long after money is exchanged! Backyard breeders often times will sell on places like Craig's List and do not screen potential owners or care where these animals go. They sell animals cheaply and bill them as being out of famous lines. Even well known males or females do produce "pet quality" offspring that shouldn't be used in a successful/responsible breeding program. Not all famous lines are good despite being billed as something “Magical.” Additionally, they may claim that they are show winning bloodlines or animals. You can research any winning show animal prior to purchase by either looking on the International Lama Registry website http://www.lamaregistry.com/showing/show-results.php or the Alpaca Llama Show Association website http://www.alsashow.org/awards.html When you research these results, you will see not only which animals have been winning (including, siblings, parents etc), but the farm and owner names. There is a huge difference between winning at the local fair and competing at a reputable show competition. Prior to buying any animal, you should do your homework. Seek out reputable farms to visit that obviously care about their animals and are not focused on just peddling their wares. You should never impulse buy and always go home to discuss decisions or potential purchases prior to committing. Never buy from someone that puts pressure on you with the promise that if you don't buy now, someone else is coming to buy them. When you buy animals to get them out of an obviously backyard situation, you only encourage the owners to make more of the animals. These type of operations cut corners on shots, feed, care, quality breeding stock etc. to try to make money. When animals do not get proper care or nutrition it does affect them later in life and changes their ability to live a normal life. Poor genetic material results in other poorly conformed and bred animals. Essentially, your short term "Good Deal," turns into a long term expense!